Travel west along the scenic coast to the village of Negril, where time stands still and relaxation becomes a way of life. 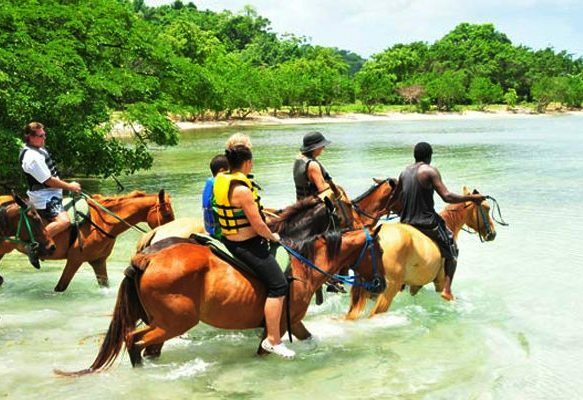 Long known for its laid back atmosphere and its 7-mile stretch of sparkling, pristine white sand beach, Negril invites you to discover the exhilaration of Rhodes Hall Plantation Horseback Ride and snorkel. Rhodes Hall Plantation is an exceptional location for Countryside and Beach horseback riding. Boasting over 550 acre of land, Rhodes Hall Plantation covers every type of terrain imaginable, creating an unforgettable experience for beginners and advanced riders. 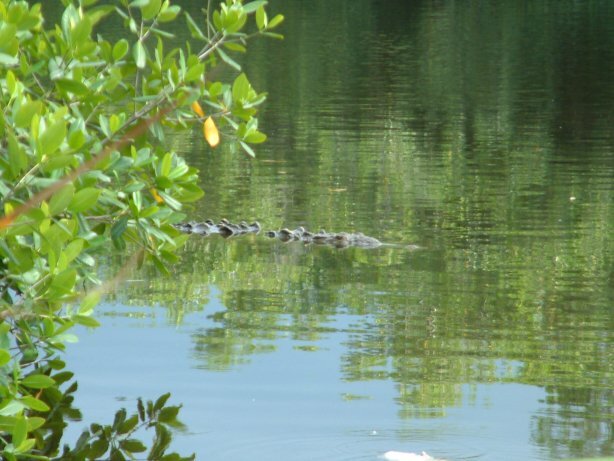 Your Rhodes Hall Horseback ride continues through Jamaican swamp, mangrove, and a visit to the largest crocodile reserve in Western Jamaica. 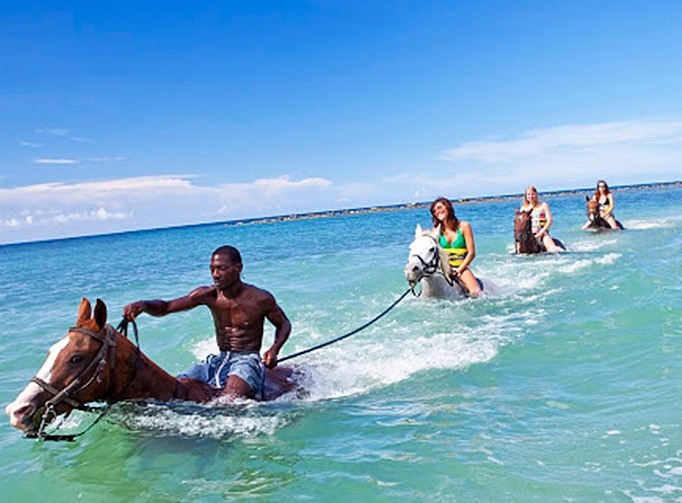 Then its time to experience a once in a lifetime moment of swimming on horseback in the ocean. What a day!! 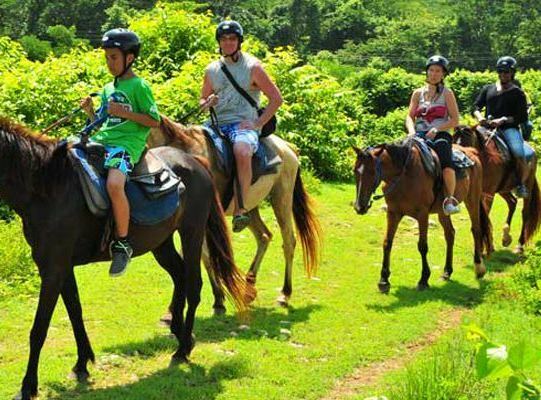 history, horseback riding, lovely scenery and the unforgettable sights and sounds of rural Jamaica. • Wear swim suit under your clothes and bring a towel, sunscreen, camera and cash. We were picked up right at specified time at Grand Palladium by our driver, Vinton. He answered ALL our many questions as he drove us to and from our destination. Van was clean, and air-conditioned. We had a wonderful time on the horses. Mine was named Ziggy. Our guides were good too. They explained how to ride and were very informative regarding history, weather, plants, trees, etc. The weather was perfect too. I will absolutely recommend Jaital to others. Thank you for this great experience! Our experience with you was excellent. 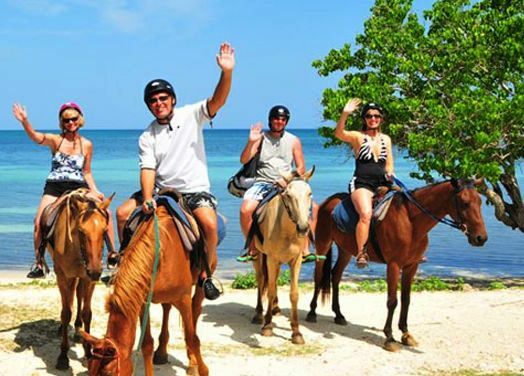 The entire team for the Negril Beach Horseback Ride was excellent. Both I and my wife are novices and they took excellent care of us. The driver was great and we would highly recommend your service and this tour. The experience was a good beautiful place. Our driver was waiting for us. He was very professional, and an outstanding driver. The tour itself was nice and calm and not too scary for someone like me, who hasn\'t been on a horse in years. We booked three excursions with them as well as our airport transfer and so glad we did. All the drivers we got were so professional and friendly. They made us feel like family on all our excursions. Our first tour was River Tubing and Dunns River Falls and what a wonderful experience it was. The river was exceptionally beautiful! Next we Negril Beach Horseback Ride & Snorkel, our first time riding and our guide was very patient with us. Our last tour was Luminous Lagoon Boat Cruise and that was simply the best. The water miraculously light up as we move around in it. We love Jamaica and will definitely be back and be sure to book more tours with you. Thanks for a memorable time in Jamaica! History and fun at its best!!!! Our driver was fun and knowledgeable. He answered all our questions and made us feel safe the entire trip. The horseback riding was great, The horse guides were fun and patient. We had 2 guides for just the 4 of us. Our Driver was professional and very accommodating. 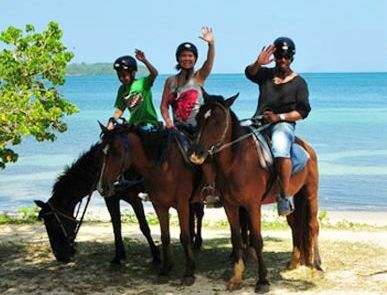 Horseback Ride & Snorkel, wonderful experience. We were in Jamaica a few days ago and stayed at Grand Palladium resort. We wanted to book an activity which would include learning a little about Jamaica. What a perfect trip! So much knowledge. The horseback ride into the ocean was amazing. Thank you!